Fresvik is a village in the municipality of Vik in Sogn og Fjordane county, Norway. It is located on the southern shore of the Sognefjorden, just west of where the Aurlandsfjorden joins the Sognefjorden. Fresvik sits about 13 kilometres (8.1 mi) south of Leikanger-Hermansverk, about 20 kilometres (12 mi) east of the municipal center of Vikøyri, and about 15 kilometres (9.3 mi) southeast of the village of Feios. The population (2001) of Fresvik is approximately 275. This village provides a starting point for hikes into the UNESCO World Heritage Site of Nærøyfjord which is 11 kilometres (6.8 mi) south, and also to the Fresvikbreen glacier which is 8 kilometres (5.0 mi) west of the village. Fresvik has been hosting the Fres music festival in July annually since 2005. Fresvik Church is located in the village, serving the eastern part of the municipality. Agriculture is one of the main industries around Fresvik Some of the main agricultural products are fruit and berries (mainly strawberries) and there are also some lush mountain pastures for cattle or sheep. There is also the Fresvik produkt factory which produces refrigeration equipment. Fresvik was an isolated valley community until 1976. People could only access the village by boat on the Sognefjorden. In 1976, a road from Feios to Fresvik was completed, marking the first time ever that there was a road connection to the village. 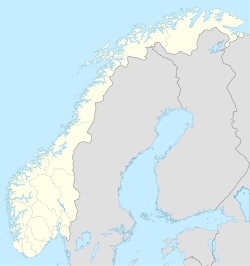 Historically, Fresvik had been a part of Leikanger Municipality since the main part of Leikanger is located directly north (across the fjord). After the road was completed to Fresvik from Feios and westward into Vik Municipality, discussions began about municipal borders since Fresvik now was more easily connected to Vik rather than a 10-kilometre (6.2 mi) boat ride across the huge Sognefjorden. As of 1 January 1992, Fresvik and its surroundings (all of Leikanger that was south of the fjord and west of the Aurlandsfjorden) were transferred to Vik Municipality. The village (and parish) is named after the old Fresvik farm (Old Norse: Frøysvík) since the Fresvik Church was built there. The first element is the genitive of the name of the god Freyr and the last element is vík which means "inlet" or "bay". Alexandra Hauglum (b. 2003) — Fresvik is featured in the 2013 documentary "Twin Sisters" produced and directed by Mona Friis Bertheussen, and later aired on public television in the USA. This film features Chinese-born adoptee Alexandra Hauglum and her parents, residents of Fresvik, as well as her twin sister Mia Hansen, adopted separately by parents from Sacramento, California in the USA. ^ "Fresvik" (in Norwegian). yr.no. Retrieved 2010-08-14. ^ a b Statistisk sentralbyrå (2001). "Folke- og boligtellingen 2001, kommune- og bydelshefter 1417 Vik" (PDF) (in Norwegian). ^ a b c Store norske leksikon. "Fresvik" (in Norwegian). Retrieved 2014-01-21. ^ Rygh, Oluf (1919). Norske gaardnavne: Nordre Bergenhus amt (in Norwegian) (12 ed.). Kristiania, Norge: W. C. Fabritius & sønners bogtrikkeri. p. 128. This page was last edited on 5 August 2018, at 22:07 (UTC).